The earliest reference I have found to Deal Port is in documents of the Exchequer: Records of the King's Remembrancer: Port Books from Easter 1565 where the Port of Sandwich and Deal is referred in relation to the 'Searcher Overseas and Coastal'. [ref 1]. This is an early form of Customs Officer. At the Restoration of the Monarchy (1660) records of many things began to be kept. Now there are many series of records indexed on-line making it easy to find the material. British History Online have many of the Admiralty and Treasury papers so we find authorisation for employment of people to various positions mentioned in the Calendar of Treasury Books. The Navy, Treasury and the Customs compiled their correspondence into volumes of Out Letters providing further information. Earlier records are available (mostly the Court Rolls) but are less easy to search. The Customs officers are there to police and collect taxes on imports and exports and to stop smuggling. This means look-out towers as well as a large office. The first named person in the records is Vincent Den who petitioned to be employed as Surveyor of Customs Deal Port in 1660 [ref 2]. Corroboration is available from the list of tenements at Deal in 1663, Vincent Denn is present (house on the Archbishop's Waste). Same to Mr. Morgan Lodge, late landwaiter at Sandwich and Deal, and Henry Appleby, tidesman and boatman at Deal, and Mr. Haselwood, late tidesman at Deal, to appear as above to make good your information against said Johnson and Randolph. The said Commissioners are to report on said order. Further they are to send officers from some other port to take the place of the officers of Deal port (Mr. Johnson, collector, and Mr. Randolph. surveyor, and Henry Appleby, tidesman and boatman), who are directed to attend the Treasury Lords the 23rd inst. 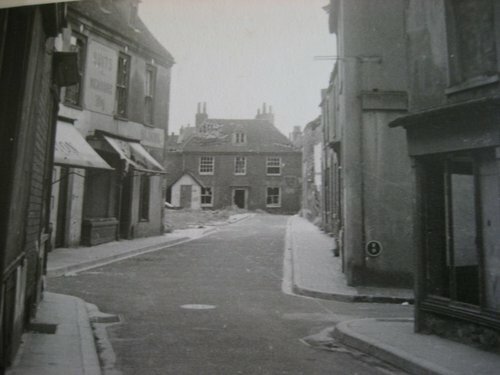 Deal at that time was a rapidly expanding new town, but the Customs were in Deal early enough to establish an office at the corner of Customs House Lane and Middle Street with up to 6 watch towers along the seafront, one being at the top of Customs House Lane. 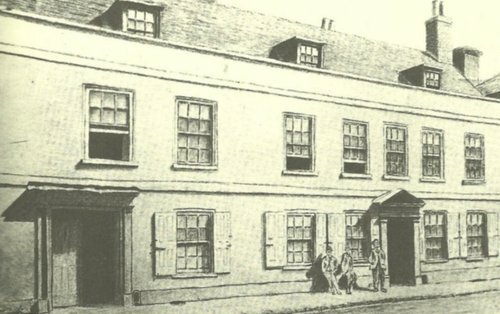 This office was in use until 1814 when they moved to bigger premises in Lower Street. [ref 3 and shown right]. There they stayed until the boats no longer came into the Downs. In 1882 Deal Customs office was closed and became three shops. Various businesses occupied the premises and finally in WW2 a bomb landed in one of them and the group was demolished. On this site we now have the Nationwide Building Society, Holland & Barretts and the Card Factory. The Collectors of Customs were made Freemen of Deal which covers the time period 1699 to 1835 which can be checked in local records. Information also appears in the Trades Directories from 1792 onwards for Deal. 1677 July Appleby Henry Boatman Ap. Reminiscences of Old Deal and Walmer by EC Clark. 1949 TF Pain (pub) from the original series of articles in 1932 East Kent Mercury. The History of Deal and its neighbourhood by S Pritchard 1864. Recent facsimile printing by Michaels Bookshop, Ramsgate. PICTURE. One of the previous occupants of the Customs House in Lower Street was John Cannon, a solicitor of eminence. 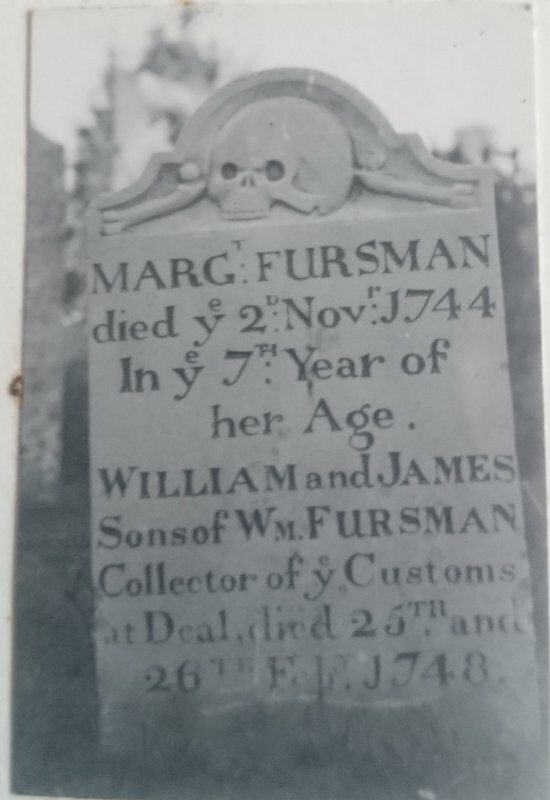 He was admitted Freeman in 1735 and in 1758 he was Mayor. [ref 4]. The building could have been built for him, it is architecturally of the right period. The sketch is from 1860's. In 1717 a writ was issued in a case of assault upon a customs house officer, John Gould. He was known to be remarkably diligent in the execution of his office, therefore the smugglers were determined to get the better of him. They made a “common purse” of £200 in order to finance them in their efforts to ruin the Customs Officer, and were ready to provide more should it be necessary. It was said that some 2 – 300 persons were engaged on the smuggling trade at the time – it was obviously paying good dividends, for the Deal “owler” to be able to raise money to that extent. There was money in the town among the ordinary folk, and this money brought trade, increased population – some notoriety – and a higher standard of living. [ref 6]. 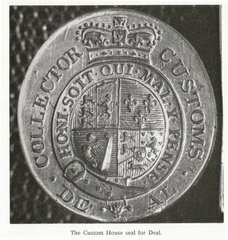 Picture of the Deal Custom House Seal. 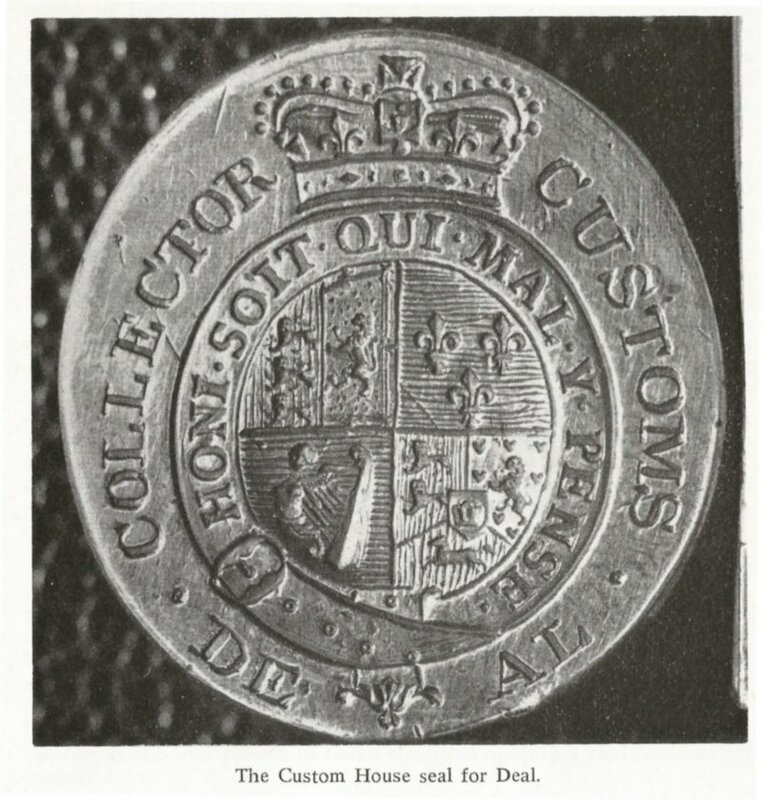 The seal is kept in the custody of the Librarian, HM Customs & Excise in London. It was made of Silver in the Hanoverian period (earliest 1714). Cargoes that passed through the Customs were stamped. The Deal example is particularly fine in the collection of Port Seals that have survived. [ref 6]. 115. Treasury warrant to the Customs Commissioners, authorising the trial for six months of a scheme, proposed as below, by Philemon Phillips, for preventing smuggling in Kent; and for the necessary orders thereupon for Robert Forster, one of the Customs Inspectors for the Thames, and said Phillips to join with the Surveyor General of Kent in the execution of same. Prefixing:—Report to the Treasury from said Commissioners, dated 1737, May 27, on the memorial of Philemon Phillips, Master in His Majesty's Navy. Memorialist alleges that having taken a survey of the Kentish coast he finds that at St. Margaret's Bay and the three neighbouring parishes there are about 200 families which subsist by smuggling: there are upwards of 200 open boats, carrying from four to five hands, each employed in bringing the brandy and other goods from France, Flanders, &c., which goods are run between the North and South Foreland, near 100 decked vessels from 15 to 35 tons, belonging to Folkestone and carrying from six to ten hands each, are employed in the like trade. To prevent this memorialist proposes to station cutters, boats with sitters, &c., watch vessels, or officers variously at King's Gate or Bartholomew Gate, the mouth of Sandwich river, in the Downs, St. Margaret's Bay, Dover, Folkestone, Dymchurch. Have had both memorial and proposals examined by Mr. Collyer, Surveyor General of Kent, who certifies that great quantities of tea, brandy, and other goods are daily landed on the coast of Kent, and from thence conveyed to London by great gangs of smugglers, who come down on the coast with firearms, and run their goods in defiance of the officers. Advise a trial of memorialist's proposals for six months. [Customs Book XIV. pp. 231–3.] [ref 2]. 11th Jan 1736/7 was appointed Waiter and Searcher at Deal replacing Ephraim Dale who was super-annuated. 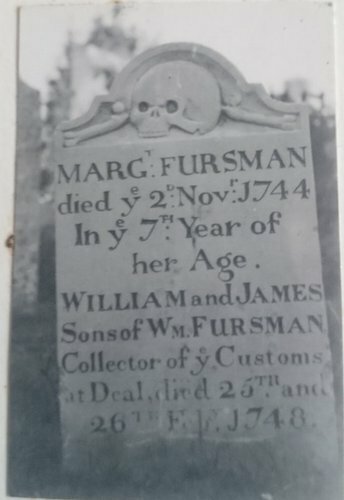 10th March 1763 William Fursman was buried at Sandwich with his wife. Here is a custom-house, consisting of a collector, comptroller, surveyor, land-waiter, 2 riding officers, 10 boatmen & 10 tide-waiters, with a naval storehouse under the direction of the store-keeper, who is clerk to the cheque. Durban, John jnr Landing Waiter to the customs. Headstone in St George's churchyard: In memory of JOHN ELBECK Private in the Westmorland Militia. Aged 27 years. Who was shot in Beach Street the 26th September 1794 by a person unknown in the execution of his duty assisting the officers of the customs. We are told in [ref 3] “the customs house in Middle Street was occupied by Mr CB Wellden in 1814. The business was an outfitters and remained over a century.” The successors were Messrs. Gray and Weston. The area was demolished after WW2 bomb damage and is now Middle St car park. 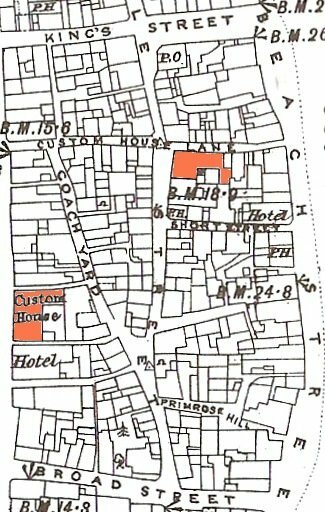 From the 1892 street renumbering scheme we find the location of this premises, marked on the map. By searching other records we find George Wellden (pawnbroker) first present in Middle Street around 1841. CB Wellden was alive 1859 to 1934 and he was the outfitters. The photo is of this shop after WW2 bomb damage. OS Map of 1871 with the two customs houses marked. Not certain where the watch-tower was. A later watch-tower was close to the Timeball Tower and leased from Lloyds of London.